Good morning. It's Tuesday, Oct. 2. • A billionaire's fight to block beach access fails. • A California city where bicycles rule the road. 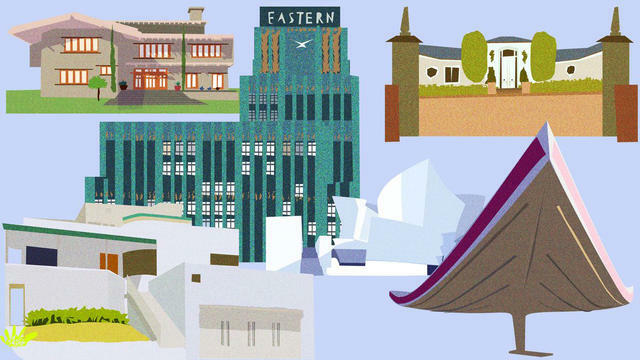 • And a cheat sheet of architectural styles in Los Angeles. 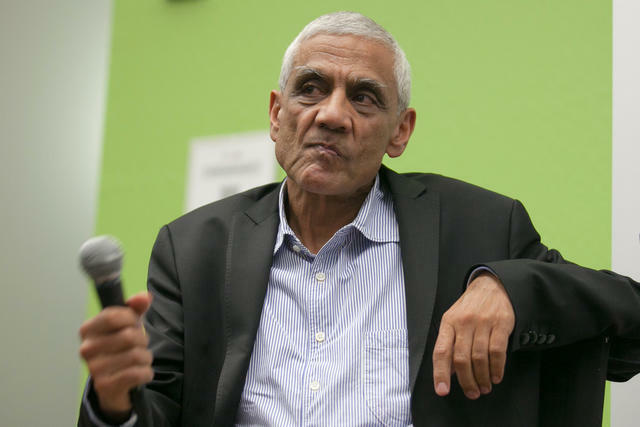 Vinod Khosla, a co-founder of Sun Microsystems, has seemed immune to criticism. Beachgoers exulted as the Supreme Court rejected an appeal from a California billionaire who wanted to block public access to a beach. Vinod Khosla's decade-long crusade to stop people from crossing his property to get to the shore in Half Moon Bay threatened to gut California’s Coastal Act of 1976, which enshrined beach access as a right. Khosla had said he was prepared to litigate the issue the rest of his life. But he may not be terribly troubled by the outcome. He told the N.Y. Times that he didn't even want to win. He just believed strongly in property rights. "You can’t give up principle," he said. A group gathered at Martins Beach on Monday saw it differently. Former U.S. Rep. Pete McCloskey reminisced about hay rides down to the cove in his youth, the S.F. Chronicle reported. "This is the most beautiful beach in California," he said, "and that son-of-a-gun would have kept it from the public." Read more in the Chronicle and Times. In California, someone can be held criminally liable for murder if it occurs during a felony they committed, even if the person wasn’t present for the killing. Now, Gov. Jerry Brown has signed a law scaling back the felony murder rule and creating a pathway to re-sentencing for as many as 800 prisoners. Hundreds of people behind bars could be set free. 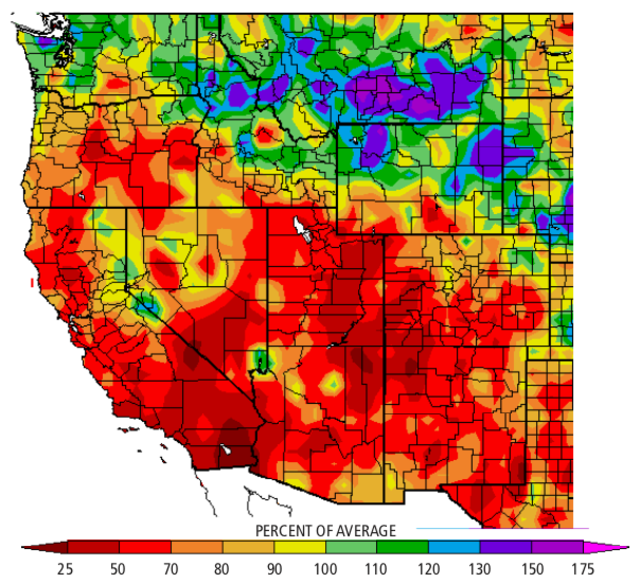 A map shows percentages of average precipitation from Oct. 1, 2017 to Sept. 27, 2018. "Hot, dry, and on fire." A report was released for California's water year, which resets each Oct. 1. It told a bleak story: The statewide snowpack was just 58 percent of average by April 1. Nearly the entire state experienced below-average precipitation, with much of Southern California receiving half or less than half of average rainfall. "Can you really blame anyone who thinks the high-speed rail project — even if you like the idea of it — is a disaster?" So asked a columnist after attending a public meeting hosted by California’s bullet train officials in Pacoima, where a proposed segment would be placed. One woman jabbed her finger at the officials: "You’re not being impacted. You’re not being impacted. You’re gonna get paid. You’re not gonna lose your house." Mineral King was so named because miners thought a fortune in metals awaited there. Mineral King is a hidden valley about 7,500 feet up in Sequoia National Park. The road there, in the words of one travel writer, is "a true thrill ride. It's a narrow, heart palpitation-producing odyssey of more than 300 curves past sheer drop-offs on a sometimes-paved, sometimes-not surface." The reward is a setting of deer-filled meadows and rambling rivers — without crowds. 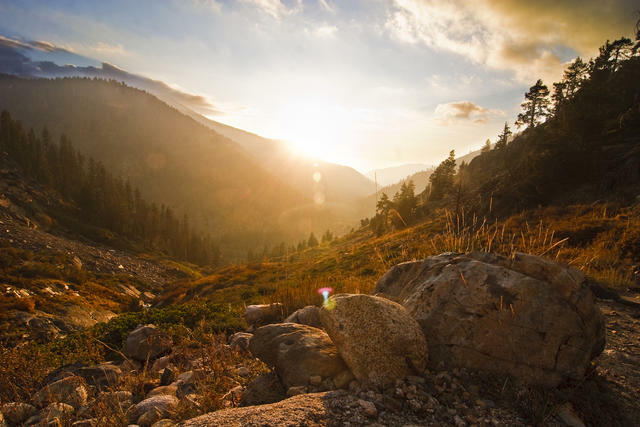 Mineral King is included in a list of 12 "wow spots" in Sequoia & Kings Canyon National Parks. The No. 1 American city for property crime? San Francisco. New F.B.I. data showed the city had the highest per-capita rate of property crimes among big cities in 2017, with 6,168 crimes per 100,000 people. That’s about 148 burglaries, larcenies, car thefts, and arsons a day. A police spokesman said a small group of auto break-in artists were driving up the numbers. 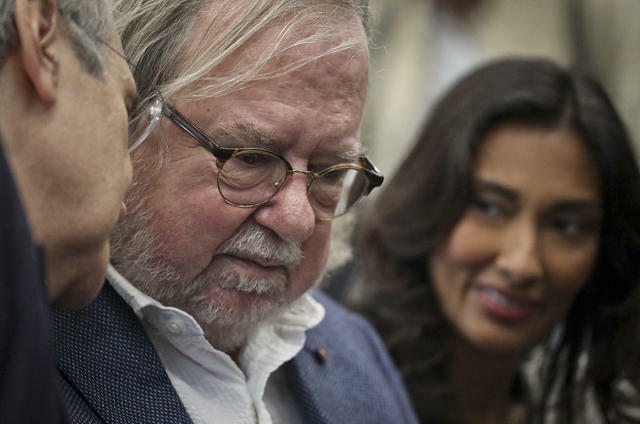 Dr. James Allison at a news conference in New York on Monday. Dr. James Allison shared the Nobel Prize in medicine for work he conducted on cancer immunotherapy at U.C. Berkeley in the 1990s. He said he was able to thrive at the University of California's flagship campus thanks to its community of smart and enthusiastic academics. "I don’t know if I could have accomplished this work anywhere else than Berkeley," he said, adding, "It was one of the happiest times of my life." The college town of Davis near Sacramento has been called America's bike capital. In many American cities, the share of trips made by bike barely reaches 2 percent. In Davis — where nearly every major street has a bike lane — it’s 10 times that. Here's an oddly mesmerizing video of a roundabout humming with cyclists on the U.C. Davis campus. Tyrannosaurus Rex versus The Dragon, circa early 1980s. 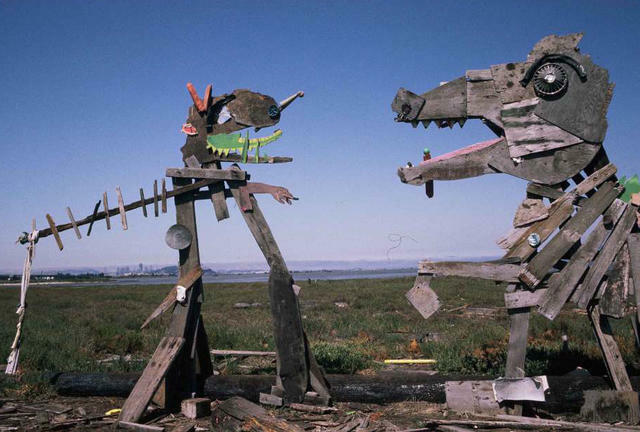 A muddy tidal flat in the East Bay used to be populated by a wonderland of fanciful sculptures. There was a warrior riding a horse into battle and a wooden dog playing an electric guitar. There were dragons, sphinxes, kangaroos, and trains. The structures were the spontaneous expression of creative locals and an irresistible canvas. But in time, Miami-style condos sprouted nearby, and the sculptures began getting mysteriously flattened. Conspiracy theories proliferated. Linda Hazelwood, left, Michelle Hamel, and Jann Blake, all from California, attended a prayer service in Las Vegas on Monday. 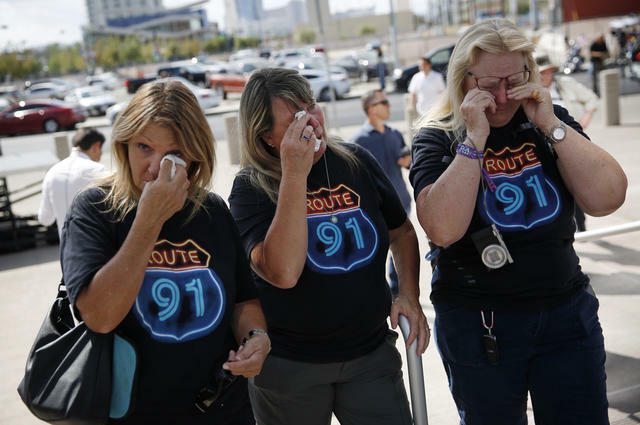 A year after the deadliest mass shooting in modern American history, the "why" remains frustratingly out of reach. The Las Vegas massacre on Oct. 1, 2017, left 58 people dead — including dozens of Californians. Investigators said the gunman was described by people who knew him as "a narcissist." Others said he may have had bipolar disorder and taken anxiety medication. But none of it adds up to a clear answer. 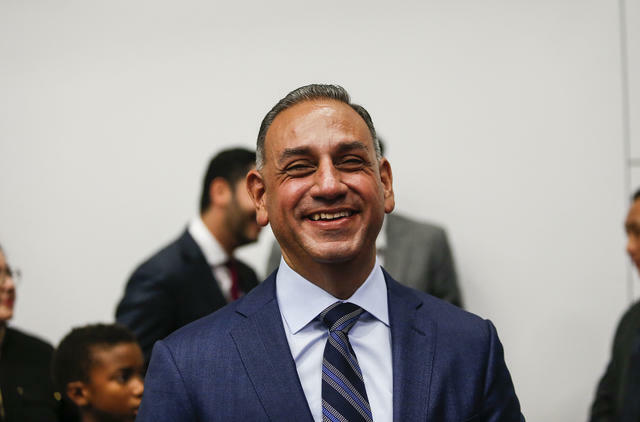 Gil Cisneros, in Anaheim this month, is running in the 39th Congressional District. In May, a woman made an accusation of sexual harassment against Gil Cisneros, a Democrat running for the House in a key Southern California race. On Monday, she recanted. In a tweet, she said she met with Cisneros and realized there had been a "HUGE misunderstanding." Rivals of Cisneros had been blanketing the airwaves with ads about the allegation. "I love my kids and my wife more than anything else on this Earth." A struggling couple had been squatting with their five children in a derelict cabin in Joshua Tree for months. When their 7-year-old died from exposure on a hot summer day, they were charged with child abuse. Now they're on the run. Googie. Midcentury modern. Eastlake Victorian. Chateauesque. Spanish-Moorish. Monterey Colonial Revival. Beaux-Arts. What city has a more diverse spread of architecture than Los Angeles? Curbed put together a cheat sheet of 16 styles that every Angeleno should know. 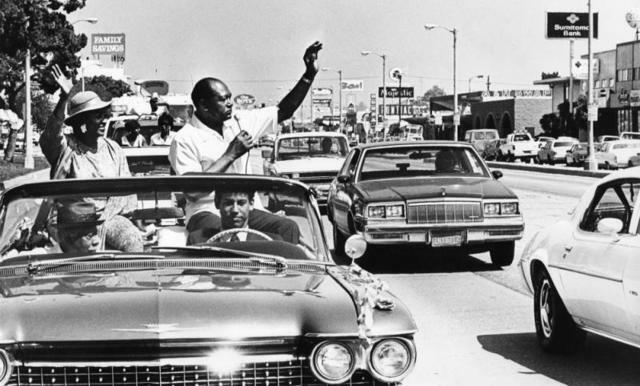 Mayor Tom Bradley campaigned on Crenshaw Boulevard in 1989. A future light rail line will run at ground level through a stretch of Crenshaw Boulevard, in South Los Angeles. That prompted an idea to create an outdoor mile-long museum along the route — including murals, sculptures, and other works — that celebrates the story of black Los Angeles. It's called Destination Crenshaw and artists have been invited to apply. "The whole street is the canvas," a city council aide said. 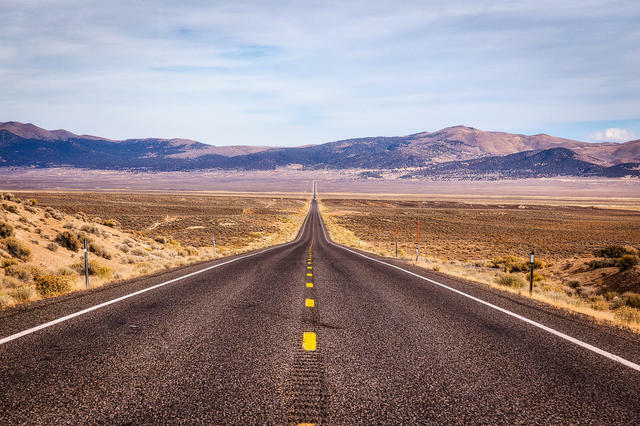 U.S. Route 50 includes a stretch in Nevada known as the "Loneliest Road in America." There are highway signs in both Sacramento and Ocean City, Maryland, indicating that the cities are 3,073 miles apart. U.S. Route 50 leaves Sacramento and spans the country's midriff — passing small town America along stretches of desert, farmland, high plains, and mountains — before reaching the resort town of Ocean City on the Atlantic. Mileage signs at the west and east coast terminuses of U.S. Route 50. Maryland highway authorities posted the distance to California in a moment of whimsy back in the early 1980s. Years later, according to Capital Public Radio, a Caltrans employee named John R. Cropper, Jr., noticed the sign while visiting Ocean City and thought, "Well, that’s a pretty good idea." Cropper was senior enough to sign off on a reciprocal sign in Sacramento. People liked it so much that they kept stealing it. 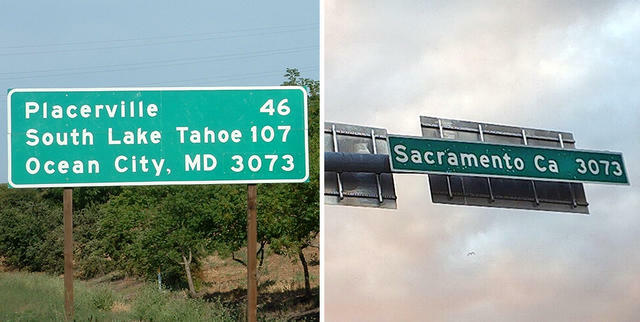 Caltrans eventually redesigned the sign to include distances to Placerville and South Lake Tahoe, making it bigger and harder to toss in the back of a truck.